As he flew passed the Sun, his tail caught on fire, turning the shimmering beautiful feathers black. By the time he flew passed the Moon, his whole body was black with soot from the hot Fire. When he plunged into the Sky and flew through the clouds, the smoke got into his throat, strangling his beautiful singing voice. It was a time of rejoicing, for Tindeh - Fire - had come to Earth. 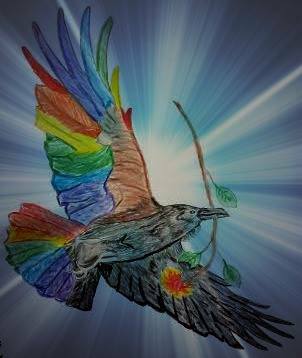 But Rainbow Crow sat apart, saddened by his dull, ugly feathers and his rasping voice. Then he felt the touch of wind on his face. He looked up and saw the Creator Who Creates By Thinking What Will Be walking toward him. "Do not be sad, Rainbow Crow," the Creator said. "All animals will honor you for the sacrifice you made for them. And when the people come, they will not hunt you, for I have made your flesh taste of smoke so that it is no good to eat and your black feathers and hoarse voice will prevent man from putting you into a cage to sing for him. You will be free."